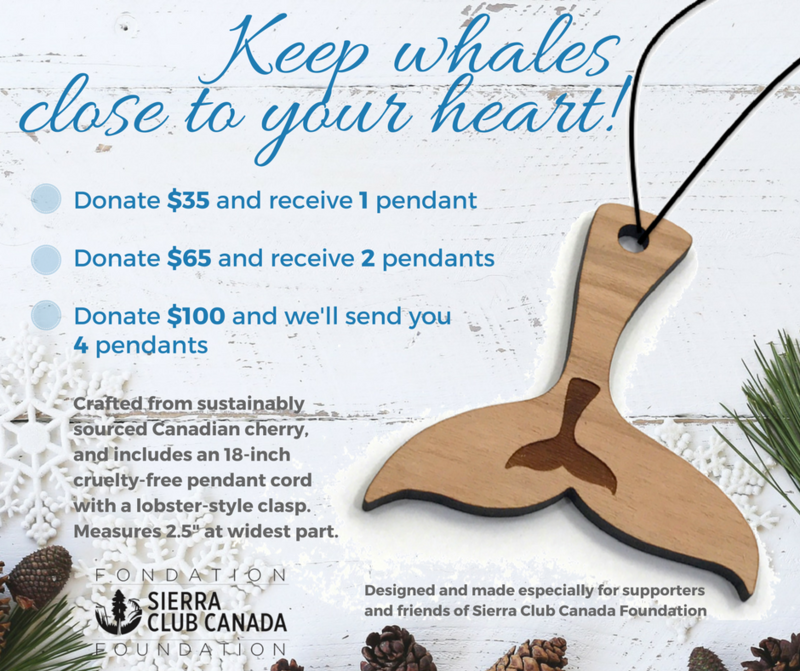 Giving Tuesday 2017 - Enjoy your whale tail pendant! Thank you for showing your support for whales! Your gift will allow us to fight for their protection at the highest level - in the courtroom! Your gift also helps us support and realize important charitable projects advancing the protection and preservation of the environment. The easiest way to give is right here on our website. Our secure donation form allows you to make a gift using Visa or MasterCard. A tribute gift is a very special way to remember someone remarkable or to honour an important day. We will send a personalized email letting them know of your kind gift and any message you wish to convey (please write message in comments box below). If you wish to direct your donation to a specific program, chapter, or to the Sierra Youth Coalition for their programs, please let us know by filling in this field. Please note that should the Foundation cancel a project or raise more money than is needed for a particular project, or should our internal organization change, the funds will then be used for the general purposes of the Foundation's charitable mission.